While there are genuinely bad people who do bad things, good people have ethical lapses. The reasons are legitimate but, in most instances, good people find themselves in situations and circumstances where, although they are fully aware the conduct is unethical, they make bad—and costly—choices. These ethical lapses can be small or large, transpire in public or private, and, although unethical, may be completely legal. No matter the magnitude, degree others are aware or legality, ethical lapses demonstrate a lack of character in what otherwise are good persons. Every ethical lapse costs an organization. The intra-organization costs are high: strained relationships, Machiavellian politics, toxic cultures and the like. These costs not only negatively impact organizational efficiency and effectiveness but also and, more importantly, devalue the organization’s wealth of personal integrity and trust. With public trust in government nearing historic lows in 2017—extending the negative trend Pew first detected in the mid-1960s—the costs associated with a loss of extra-organizational trust and integrity can be also very high, as the organization’s ethics as well as those of its personnel are called into question. The lesson for public administrators? Left unaddressed, ethical lapses increase cynicism among subordinates and stakeholders. They also increase the public’s mistrust of those subordinates, organizations and its stakeholders as well. Even more costly is the threat ethical lapses pose to the common good. To avoid becoming ensnared by costly ethical lapses, the public administration ethics literature generally advises practitioners to focus upon developing greater ethical competence and building more ethical organizations. This prescription assumes, of course, that public administrators are themselves ethically competent. Tip #5: Watch what you “EAT.” The acronym stands for “Ethical Acid Tests” meaning that your decisions must stand up to public scrutiny. Gilbert asks: “What if your decision appeared on the cover of the local newspaper or was broadcast?” In addition, “Would you want other significant persons in your life to do the same?” Lastly, Gilbert asks: “Does this decision advance the long-term common good?” For public administrators, Cooper’s New York Times and CBS’ 60 Minutes tests come to mind. Ethical lapses provide administrators what Gilbert calls “ethical acid tests” of their ability to provide ethical leadership for subordinates, the organization’s stakeholders and the public. Gilbert reminds administrators that what they say and how they act is the primary way administrators earn the trust of subordinates, challenge them to develop greater ethical competence and avoid ethical lapses which can prove costly to themselves, their organizations and the common good. None of Christopher Gilbert’s tips are news to ASPA members, as its Code of Ethics (2013) reminds them to do the right thing in the right way by striving to demonstrate personal integrity (#6) and to promote ethical organizations (#7). The Code asserts that ASPA members evidence personal integrity as they “[a]dhere to the highest standards of conduct to inspire public confidence and trust in public service.” To this end, the Code provides eight ethical acid tests (“practices”) that members can use to assess their personal integrity. The Code also maintains that members promote ethical organizations as they “[s]trive to attain the highest standards of ethics, stewardship, and public service in organizations that serve the public.” Once again, the Code provides seven ethical acid tests that members can use to assess the degree to which they are successful in promoting the development of more ethical subordinates and organizations. 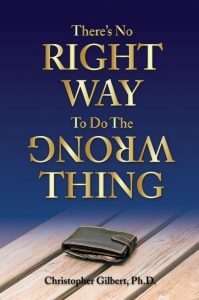 Gilbert reminds administrators that the foundation for “doing the right thing in the right way” is personal character, especially one evidencing the virtues of integrity and trustworthiness. To this end, ASPA members strive to embody the Code’s principles and practices, using the latter as “ethical acid tests” to assess their success in cultivating personal character and demonstrating increased ethical competence. Too simplistic? The current Federal regime is immoral, incompetent, and unethical, but is superficially legal. The “ethics” of following the rules says that external, public “whistle blowing” is “unethical.” Or is it responsible and necessary? Under what conditions? To what extent is “ethics” used to compromise performance? We need to extend the conversation and provide examples of “ethics” based controversies, especially ones where the “ethical” decision turned out to be wrong.